The period spanning the 1880s to 1945 was a crucially important formative time for Korea, during which understandings of modernity were largely shaped by the images of Korea’s neighbours to the east, west and north. China, Japan and Russia represented at some moments modern threats, but also denoted a range of alternative modernity possibilities, and ultimately provided a model for Korea’s pre-colonial and colonial modernity. This book explores the way in which modern Korea perceived its geographic neighbours from the 1890s until 1945. It shows that Korea's modern nationalism was at the same time internationalist in its orientation, as the vision of Korea’s ideal place in the world and brighter national future was often linked to the examples (positive and negative), threats (perceived and real) and allies abroad. Exploring the importance of the international knowledge and experience for the formation of the Korean nationalist paradigms, it offers nuance to the existing picture of the international connections and environment of the Korean national movements. It shows that the picture of Japan inside the anti-Japanese independence movement of the colonial period was more complicated than simple hatred of the invaders: modern achievements of Japan were admired even by anti-colonial nationalists as a possible model for Korea. The book also demonstrates the extent to which Chinese and Soviet revolutions influenced the thinking of modern Korean intellectuals across the whole ideological spectrum. Introducing new sources presented in English for the first time, and including themes such as race and ethnicity, global revolution, and gender, this book will be of great interest to students and scholars of Korean, East Asian and Russian history, as well as historians of the colonial/modern era more generally. "… this book is highly readable, providing a thorough and textured intellectual history, with due consideration of historical context always at the forefront of the author’s concerns. It also offers an enlightening introduction to both well-known and more obscure authors and their works. These are some of the many qualities that make this book highly recommended." 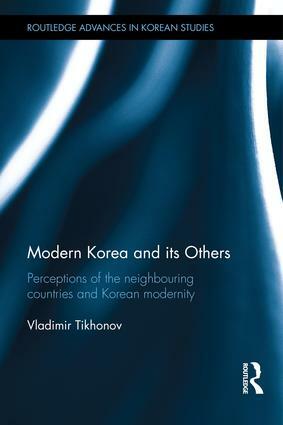 Vladimir Tikhonov is a professor of Korean and East Asian studies at the Department of Culture Studies and Oriental Languages, Oslo University, Norway. He recently published Social Darwinism and Nationalism in Korea: the Beginnings (2010).